This is the first course devoted to bioelectrochemistry held within the frame- work of the International School of Biophysics. Although this branch of scientific research is already about two centuries old, as a truly independent one it has been in a stage of lively development since only a few decades ago and this is why a first course at the E. Majorana Center was devoted to it. 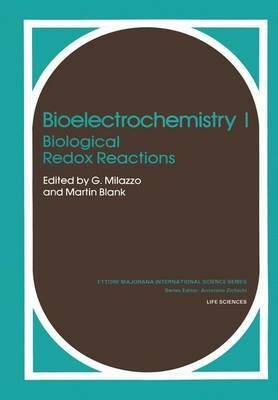 Since bioelectrochemistry consists of many sub-fields, it is impossible to include, even superficially, all of them in a short course lasting just a week, and therefore the chapter of redox-reactions was chosen for this first course as being most general in character. But even restricting the course to redox-reactions, only a few subjects could be included and therefore the choice among them was made considering the most general guidelines that could serve as a basis for the further study of individual problems. In this way we hope to give a sound basis to the study of and to stimulate further interest in this branch of both biological and physical chemistry. This dual interdisciplinary approach is, on the other hand, unavoidable if a more rigorous and logical attack on biological problems in living bodies is to be carried ahead. VII CONTENTS ix Symbols and acronyms Opening address A. BORSELLINO 1 Bioelectrochemistry and bioenergetics: an interdisciplinary survey G. MILAZZO 5 General criteria for the fulfilment of redox reactions R. BUVET 15 Photosynthesis - selected topics H.